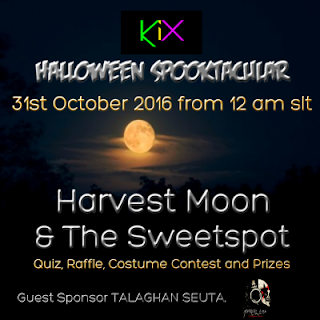 Kicking off on 31st October at 12 am from the roof of the Halloween Tower below the main store; KiX and Harvest Moon plan to get spooky. We have a costume contest, raffles and spot prizes. Halloween Quiz Time from 2-4 am with Quiz Mistress Sonja and DJ Danilao. More DJ's and games will be on throughout the day. Creep through the graveyard and up the stairs as you dodge the ghosts along the way. They are friendly... mostly.